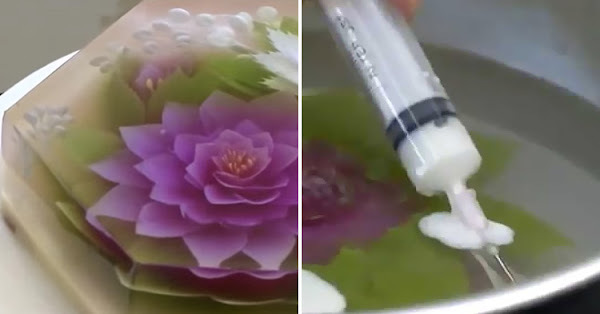 Home / Cake / Food / Jelly / Video / How to make a Beautiful "3D Jelly Cake"
How to make a Beautiful "3D Jelly Cake"
The technology advances not only on the Information Technology field, but also in the culinary world. Like this amazingly beautifully created cake. Cakes evolved from a simple bread with sweets on top, into edible Gold covered one with Swarovski crystals, and then transformed into interactive cakes just like on the wedding of Philippines' power couple, Marian Rivera and Dingdong Dantes. A final product of the viral cake design. This amazingly beautiful "3D Jelly Cakes" make rounds in social media websites, capturing the taste buds of online users. 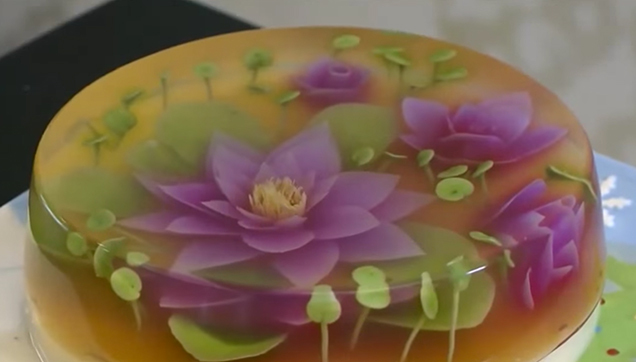 On this video by 3D Jelly Cake on YouTube, they showed the viewers on how the crystal cakes were created. Part of the video showing the chef injecting different colored water inside a large block of jelly. They used different spoon-like blade designs to shape up the injected colors. And then after setting up the designs, the covered the cake with some fruits and another layer of jelly. Watch the amazing footage and try to make your own. Step-by-step creation of the cake on the video.